It's been one hot minute since we last posted, my friends. No, we weren't hiding under a bridge or road trippin' to the Dani California nor to the other side of Michigan. We just recorded some tunes and decided that we can't stop the blog. We have to take this to a higher ground. 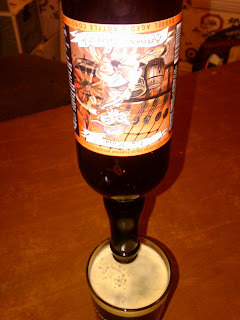 So we present to you, the first blog of the year- Jolly Pumpkin's La Roja. La Roja is an amber farmhouse ale aged in oak barrels for two to ten months. It smells and looks like cider. This bomber won't get you bombed, weighing in at 7.2%, but it'll get you started. Upon entry of the beer receptacle, you will instantly recognize the Jolly Pumpkin yeast strain. Much like its brothers in brew- it is sweet, however, there is a spiciness to it with warm alcohol feel left on the tongue. Considering all things Jolly Pumpkin, this is our second favorite next to Ordo de Calbaza. It's got instant recognition just like Anthony Keidis' voice and packs a nice punch just like his heroin habit,... well, maybe not that big of a punch. While very good, it IS incredibly Jolly Pumpkin like- more or less being in a parallel universe... of beer.